The TerraNova® Tests are a series of achievement tests used to assess students in grade Kindergarten through 12th grade in reading, language arts, mathematics, science, social studies, vocabulary, and spelling. These tests measure a child’s higher-order thinking skills, as well as basic and applied skills. TerraNova provides the highest standards in research, item reliability and validity, and technical quality, giving good placement information and feedback for each child who takes it. TerraNova Complete Battery gives detailed diagnostic information. This series of assessments provides achievement scores, objective mastery scores, and performance-level information. TerraNova Survey is an abbreviated version of the Complete Battery and provides a general measure of achievement with a minimum amount of testing time. TerraNova Plus Tests provide in-depth information about a child’s basic skills. The Plus tests are used for additional diagnostic information about a child. What subjects are covered on the TerraNova tests? What is the difference between a state or proficiency test and an achievement test? Proficiency or state testing shows the understanding a child has AFTER they are taught all of the content. Achievement tests are used to evaluate a child’s cognitive ability based on content that he has not been specifically taught, but is expected to have mastered. How should my child prepare for these subjects? Reading/Language Arts – Have your child read as many books at their grade level. They should pay attention to grammar, spelling, vocabulary, rhyming, and should also be able to give a summary of the story and explain its main idea. Mathematics – Make sure your child understands concepts like sums, differences, comparisons, more or less, and the value and identification of coins. Science and Social Studies – Review material that is age-level and grade specific. Test-taking Tips – Your child needs to be familiar with multiple choice tests, being sure they know how to eliminate answers that are incorrect first. Be sure your child takes his time and reads each question carefully. Here are a couple practice questions to get your student started. For more, you can find them here at TestingMom.com. Look at the boxes across the rows and up and down the columns. Do you see how they are related to each other? 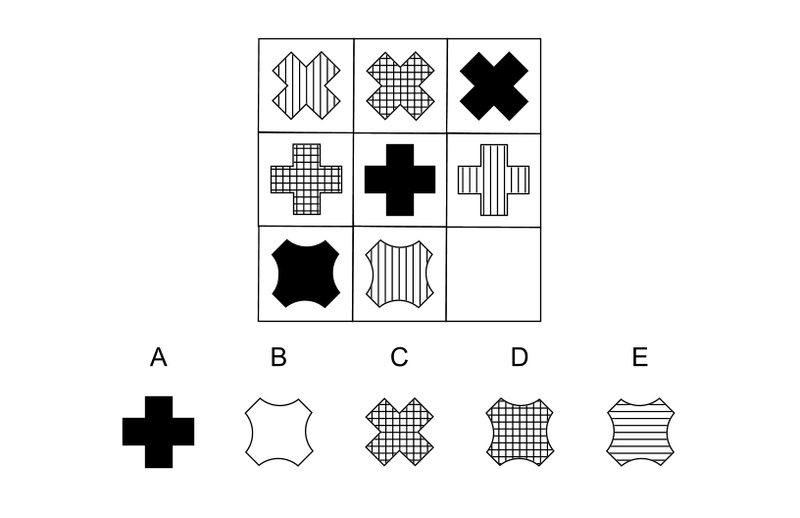 Can you find the answer that goes in the empty box so that the designs inside the rows and columns follow a pattern? Barney has cats. One cat is black with pink eyes. One cat is blue. One cat is brown with yellow eyes. He painted a picture of his 3 cats. Choose the picture he painted of his cats. Did your child struggle with any of these sample practice questions? Answers are below. Mind what you are saying to your child…speak positively and keep it fun! What is the TerraNova Test? How is the TerraNova Test Scored? Also, you can go here to TestingMom.com.